That song was written by Henley and Mike Campbell, but all but one other song on the album was written or co-written by Danny Kortchmar, a frequent collaborator of Henley’s. Kortchmar has the sole writing credit on today’s SOTD. He also co-wrote most of the tracks on Henley’s 1989 follow-up, The End of the Innocence. 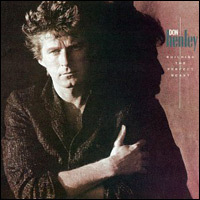 I have a complicated relationship with Don Henley. It probably stems back to my active dislike of The Eagles, because Henley is the most prominent Eagle of all. He’s immensely talented, no doubt. It’s hard to argue with the effectiveness of a song such as ‘Desperado,’ even as its sibling ‘Hotel California’ makes me want to pull my hair out. And sometimes his vocals just annoy me, while at other times it seems like he has the perfect rock voice. What is it with this guy?